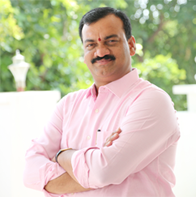 Ragidi Thirupathi Reddy, is the founder and Chairman of Kanakadurga Group, started on 15th August 2014. Ragidi Thirupathi Reddy, earned more than18 years of vast & tremendous hands on experience in Chit Fund business and its allied activities. With his knowledge, experience and relations he started Kanakadurga chit funds. Later he extended his arms and invested & acquired various companies. At present the Group comprises of Nine companies. The Chit Fund Company which was started in 2014 with one branch in Hanamkonda initially, expanded throughtout Telangana to Thirty (30) branches, with in the span of 2 years. It clearly depicts/shows his commitment and dedication towards the work. When we look inside of him, he is simple and straight forward with candid personality. During his life journey he faced many ups & downs he resolved them with his consistency, perseverance, collaborative and generous attitude. Besides achieving money and fame he also achieved customer satisfaction and their trust and stood as Symbol of Success.